The HTML version of this piece was originally posted here in July 2007. The CSS (or something) is messing up the drawing, and the original drawing from Ashley's blog is no longer online, so I emailed asking if he could send me the file. The above is a screenshot (.png) made from the .htm opened in Firefox without any blog post middleman. If you click this link you can see the version discombobulated by Word Press. More on Ashley and the subject of making HTML drawings in an era of CSS, json, and overbearing web developers who stole publishing away from the People, man. See also More Chris Ashley a la Bloglines for another mangling of this piece. The HTML version of this piece was originally posted here in August 2007. 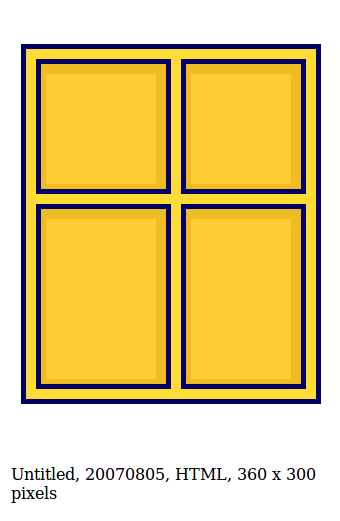 The CSS (or something) is shifting the yellow object to the far right, and adding some faint border lines. The original drawing from Ashley's blog is no longer online, so I emailed asking if he could send me the file. 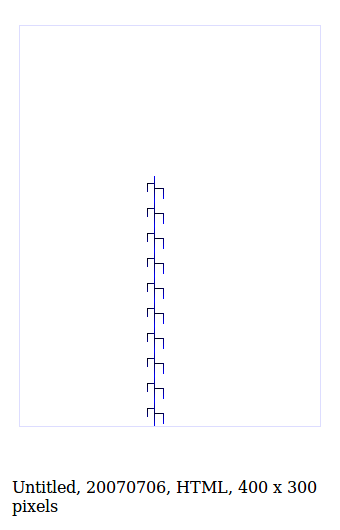 The above is a screenshot (.png) made from the .htm opened in Firefox without any blog post middleman. If you click this link you can see the version altered by Word Press.